HomeHIKE SmartWhen Does Hiking Season End? 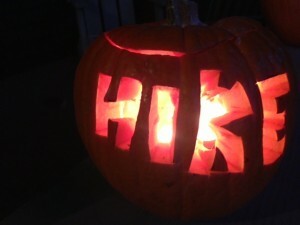 For some U.S. hikers, the end of hiking season comes on Columbus Day, for others on Halloween. Still others regard Thanksgiving as the end of the traditional hiking season. I say wait a while before you hang up your hiking boots. Plenty of good hiking awaits you in the woods and mountains before the snow sticks. Apparently many hikers who live in lands of little or no snow have deep empathy for their snowbound brethren because they, too, drastically curtail their hiking in mid to late autumn. Other hikers who could enjoy cold, but snow-free, winter hiking don’t. Such reluctance could be the guilt caused by partaking of the pleasures of the trail while hikers in colder climes are housebound, but more likely their reluctance is really resistance to the notion of venturing out into the cold. Cold-weather hiking has its rewards for the hiker who makes extra preparations and takes extra precautions. One reward for hiking in the colder months is more solitude on the trail. A deciduous woodland of leafless trees sure looks different in December than it does in its fully leafed-out splendor in July. The cold air is invigorating and the vistas inspiring in the clear mountain air. Check out The Trailmaster’s Cold Weather Hiking Tips.